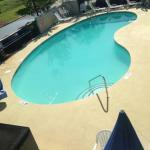 Guests can expect free breakfast free Wi-Fi and an outdoor pool when choosing the Baymont Inn and Suites Orangeburg North which is close to the interstate. The two-story Baymont Inn has exterior corridors leading to 69 basic rooms all with free Wi-Fi. The budget-friendly rooms are available in smoking or non-smoking and supply guests with HDTVs coffeemakers and work desks. Grab a bite at the free breakfast each morning before getting to work in the exercise room or business center. The outdoor pool helps guests beat the heat and other perks include a 24-hour front desk a guest laundry free local calls and free parking. Pets are allowed for an extra fee. A half-mile south of I-26 between Columbia and Charleston the Baymont Inn is five miles from Orangeburg's center. There are several fast food eateries within five minutes and the campus of South Carolina State University is four miles away. A couple of local spots within 15 minutes include Edisto Memorial Gardens and the I.P. Stanback Museum and Planetarium. Columbia is a 45-minute drive away and offers the South Carolina State Museum Riverbanks Zoo and Botanical Garden and events at the Colonial Life Arena. Columbia Metropolitan Airport is 35 miles north of the hotel.